My solar system chauvinism is well-established, but I am as much a sucker for beautiful astrophotos as the rest of you. Once in a while I get a media advisory from the European Southern Observatory about a new pretty picture posted on their website, and then I inevitably lose an hour following links to one stunner after another. 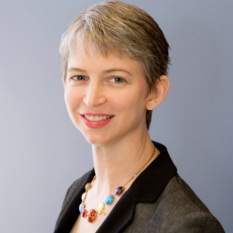 Here are a few that particularly struck me on a recent random walk through their website; I heartily encourage all of you to take your own turn through their archives! Here's the one that prompted my journey through the ESO archives last week. 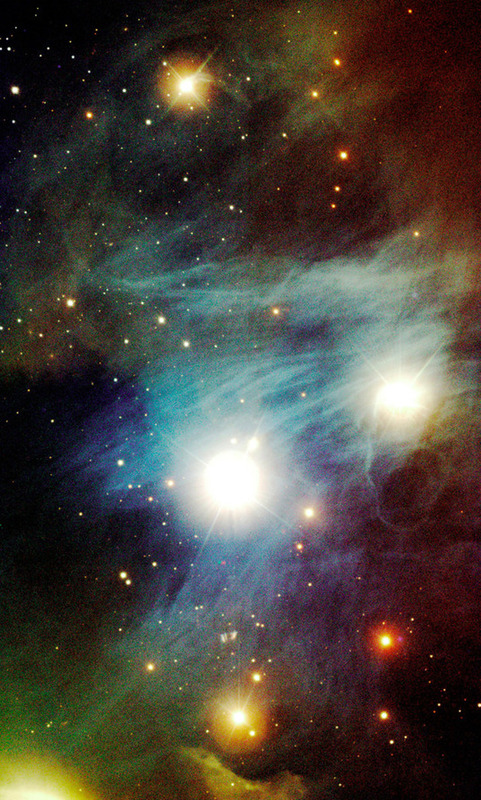 A stellar nursery of cool cosmic dust obscuring background stars, with two blazing baby blue stars beginning to blast the dust clear of their neighborhoods. On the left of this new image there is a dark column resembling a cloud of smoke. To the right shines a small group of brilliant stars. At first glance these two features could not be more different, but they are in fact closely linked. The cloud contains huge amounts of cool cosmic dust and is a nursery where new stars are being born. It is likely that the Sun formed in a similar star formation region more than four billion years ago. 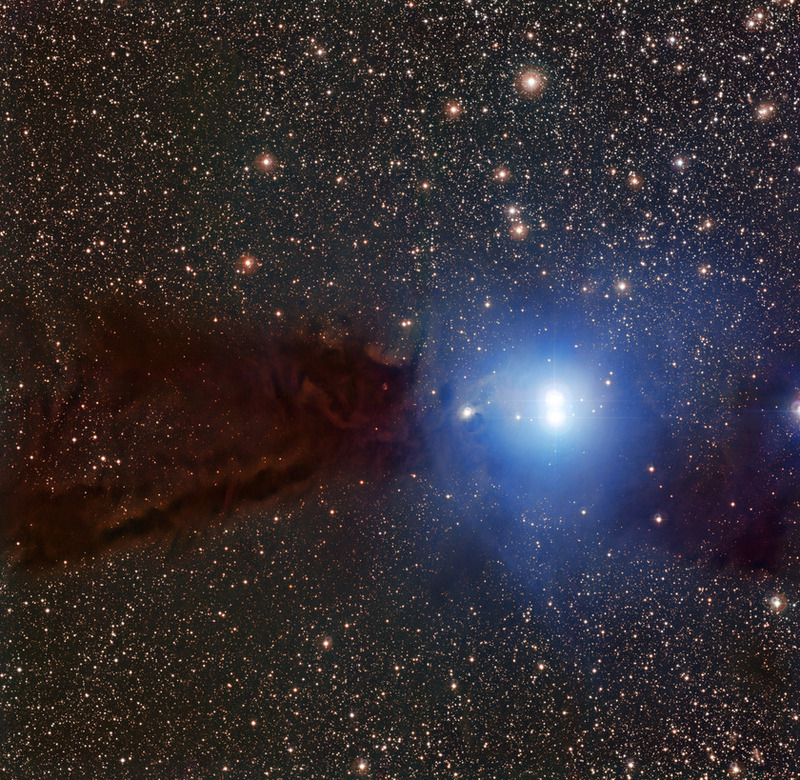 This cloud is known as Lupus 3 and it lies about 600 light-years from Earth in the constellation of Scorpius (The Scorpion). The section shown here is about five light-years across. Here's an amazingly colorful palette of stars and nebulae, achieved by viewing the Chameleon I region in visible and near-infrared wavelengths. The original image was extremely noisy but I liked its colors so I applied a bit of a blur and reduced its size to squash the effect of the noise somewhat. This is an operation I commonly apply to noisy planetary images, but I'm not sure if it will offend astronomers for me to try to blur noise away in this fashion! A sky area near the Chamaeleon I complex of bright nebulae and hot stars in the constellation of the same name, close to the southern celestial pole.This picture was taken a few days before the inauguration of the Paranal observatory and its "hand-over" to the astronomers on April 1, 1999. This next one is also speckled, but not a single one of those specks is "noise." Each and every one is something -- a star, planet, galaxy, or bit of sky obscured by dust. 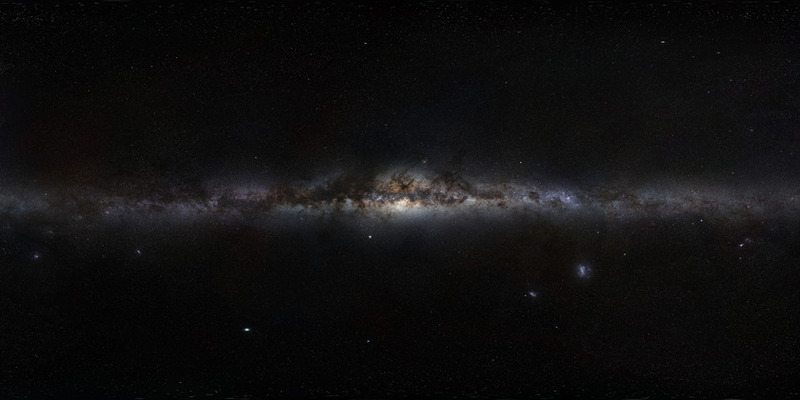 This is the entire sky, projected so that the galactic plane crosses the center, making it seem as though we're standing outside the Milky Way (though of course we are embedded on its outskirts). The amazing thing about this particular photo is that, even when you enlarge it, you're seeing it at something like only a seventh of the resolution of the image product it's made from. That product is ESO's "GigaGalaxy Zoom" project. Finally, because one galaxy is not enough, here's the sort of photo that used to make me feel vertigo as a kid: a galaxy cluster. At the resolution embedded below, it looks like a starry sky. In fact, nearly everything in this photo is not a star -- each is a galaxy containing a billion-ish stars. (Stars are round overexposed dots, usually with rays resulting from internal reflections in the telescope optics. There's also at least one asteroid, recognizable because of its dotted-line appearance as red, then blue, then a long way away, green dots.) The original image is astonishingly huge, more than 17,000 pixels wide. 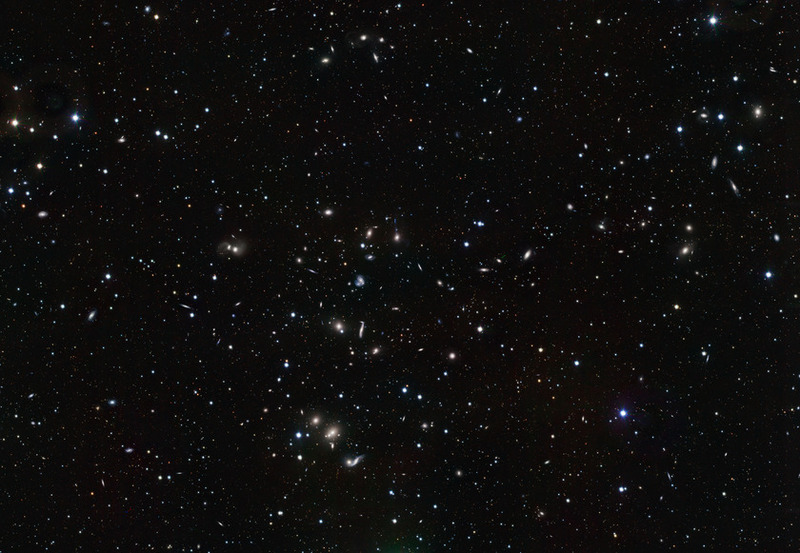 A wide variety of interacting galaxies in the young Hercules galaxy cluster. The image is about one degree wide. A million, billion, maybe more. Some galaxies are round, some flat. Some form spirals. Some seem fat. Some are egg shaped. Some have bars. All have stars, and stars, and stars. Speaking of poetry, pictures like the Hercules galaxy cluster make me think of these lines from William Blake's "Auguries of Innocence": To see a world in a grain of sand, And a heaven in a wild flower, Hold infinity in the palm of your hand, And eternity in an hour.